As you may know i'm off on my holiday this weekend, i've already been away to Wales last month and I have had my eye on a few more trips towards the end of the year. Clint and myself have been together a year in August so are planning a trip away for our anniversary, I really want to go somewhere romantic like Paris or Edinburgh. I haven't been to Edinburgh before and i'd love to try somewhere new! The Scottish capital has plenty of tourist-pleasing sights and tartan-buying opportunities on offer, but these days it’s also home to a thriving bar and restaurant scene. So if you feel like spoiling yourself on a weekend away, Edinburgh is the perfect place for you and someone special to eat, drink and be merry in style. A Travelodge hotel in Edinburgh is the perfect place to stay in cost conscious comfort, so that you can use the money you save on accommodation to treat yourself to a slap up dinner. What could be more decadent than indulging in a leisurely breakfast or brunch as the world rushes past you? Edinburgh’s thriving café culture means that when it comes to places to feast on waffles, granola or bacon and eggs, you’re spoiled for choice. Urban Angel in Hanover Street (in between the two main shopping areas of George Street and Princes Street) is a real locals’ favourite and when you taste their eggs benedict and French toast, you’ll know why. Alternatively, check out Falko Konditormeister for an authentic taste of gourmet German baking on Edinburgh’s Southside. Whether you’re after a Michelin-starred experience in a chic restaurant or a nice deli to grab some picnic bits from, Edinburgh’s got all that and everything in between covered. Try stylish, modern Italian Centotre on Edinburgh’s George Street for scrumptious food in the grand setting of a former bank, or take a detour down picturesque Victoria Street for a fantastic array of lovely restaurants, many of which do great lunch deals. If you’re too busy sightseeing to stop, drop in at Oink which does one thing – hog roasts – mouthwateringly well. 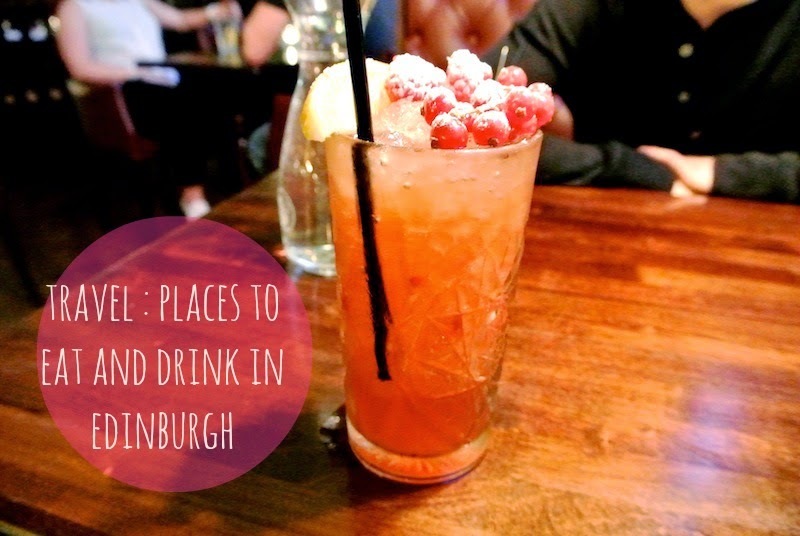 If sipping cocktails in a stylish setting is your thing, then Edinburgh won’t disappoint. Upmarket shopping street George Street also has the best bars and if you’re visiting in August, they all spill outside onto the temporarily pedestrianised road to create one long, buzzing party street. Or try Bramble on Queen Street for fantastic alcoholic concoctions in romantic dimly lit surroundings. Fans of traditional pubs will find gems on every corner but head to Rose Street or the Grassmarket for the best choice. If you want dinner to be a grand affair then Edinburgh has its fair share of fine dining experiences, like celebrity chef Tom Kitchin’s critically acclaimed restaurant Castle Terrace. For old-fashioned romance, it’s hard to beat the candlelit ambience of Café St Honoré, a hidden gem down a cobbled lane in the city centre. Big groups who want to be able to let their hair down in style should head to the Indigo Yard in the West End where you can eat first and party at the bar afterwards. Whether you take the approach of booking months in advance to secure the hottest table in town or just wander out of the hotel in the evening until you come across something that takes your fancy, your taste buds are in for a treat in Edinburgh.